"Listen up and think fast, young pizza makers! Chef calls out toppings for children to put on (and take off) their pizzas. What we thought: This game is so much fun! The whole family had a blast building pizzas according to the instructions the pizza chef shouted out to us. The game has two levels, one for beginners and one that is a little more advanced. Level 1 was great for 3 year old D and Level 2 was good practice for 5 year old A. Pizza Mania is a really fun way to encourage early math skills and lays a solid foundation with words like "add" and "take away." The kiddos didn't even realize they were doing math! What a great way to introduce addition and subtraction:) ABCD Diaries gives Pizza Mania an A+! 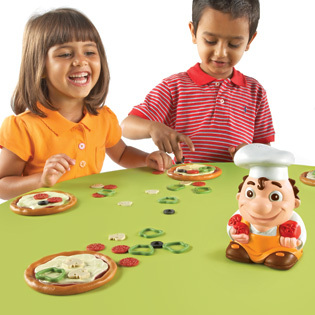 Find Pizza Mania and many more eductional games at Learning Resources!